Well, incoming 1L's... summer is flying by and you will soon be official law students. This time last year, I was a mix of nerves, excitement, and trepidation. I read everything I could get my hands on to help prepare but I was so very nervous. For all of you feeling the same way, just try to enjoy your summer. Now that I am officially a 2L, I reflect back on my 1L year and all the things I learned. 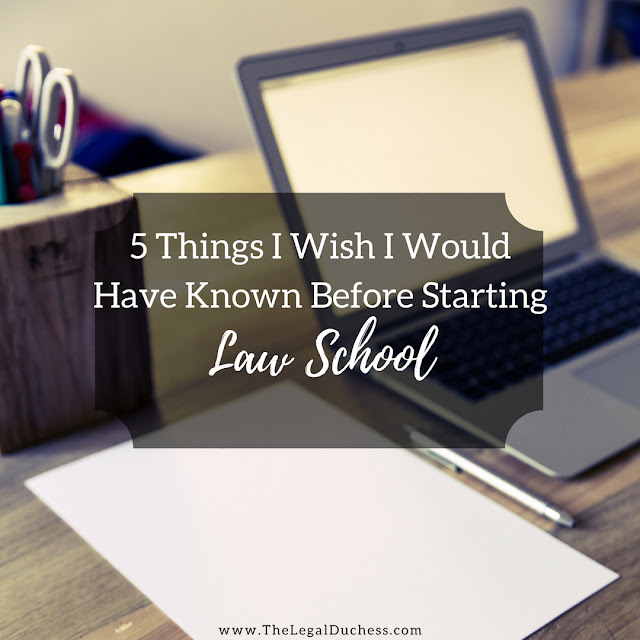 Here are 5 things I wish I would have known prior to starting law school. Law school is completely different from any kind of schooling you have had thus far. Classes are different, the school atmosphere is different, the workload is different... there is simply no way to prepare for what it is like. You simply dig in, spend the first month confused as could be and then it will get easier. Law school is crafted in a way to retrain your thinking along with teaching you massive amounts of black letter law. It is not the literature and calculus classes of undergrad- it is training you to become a legal professional in every way. It is also a place where you are surrounded by very smart and very accomplished people day in and day out.... most law students were the smart, organized people of undergrad. Now you are one in a group of smart and organized people and no longer will you be the smartest. You have to work harder and lower your expectations some or you may just go crazy. Professors will not hold your hand in law school; they will help you but you have to do the legwork and come to them with thoughtful questions. Classes require preparation and constant vigilance to stay on top of the lecture and to avoid embarrassing yourself on a cold call. Additionally, you spend law school cultivating your image as a legal professional from resumes and interviews to new suits and a solid handshake is all another layer in the law school onion. Prepare yourself for an experience unlike any you have had before... it will be hard, it will be fun and you will walk away from the other side a slightly different person. There will be several times throughout 1L year where you question your intellect, mental capacity, emotional status and overall ability to make it through. I can say, you will survive and will likely thrive! You are capable of so much more than you may think. You will be able to memorize, understand and apply massive amounts of law by December. You will learn to read faster, you will be able to complete a cold call and you will come out on the other side unscathed... okay maybe a little exhausted and brain-fried. Your brain is capable of retaining so much information- it is truly amazing. You have the mental and physical stamina to make it through two weeks of finals... you just may have to dig deep. You have what it takes to be an attorney... you just have to push yourself through three years of testing your limits to get there. But you can do it... I somehow made it through 1L year and they say that is the hardest. If I can do it, you can to. I hate to even say that but it is true; law school will strain your relationships. Your family and friends (if not attorneys) will not understand what you are going through. They will not understand the vital importance of an outline. They will not understand why you reference law in everyday conversations and will continue to crack lawyer jokes despite your annoyance. They will not find Pierson v. Post nearly as interesting as you do. You will forget to text friends back, you will have to skip date night to read and you may have to say no to Thanksgiving dinner with the family to finish your fall outlines. Your friends may get annoyed at your unavailability and lack of excitement over going out on Friday nights or binge watching Netflix. Your significant other may not like it when you choose reading over them... again. Your family will be confused as to why you are spending so much money to go to school and be slightly miserable for 3 years. There is no way around this- unless you have attended law school, you simply do not understand what a law student goes through 1L year and why it will affect every part of their life. The best thing you can do is explain what you are going through, why you are doing what you are doing and ask for simple understanding. You may drift away from some friends and your relationship may not survive... I know so many people who went through break ups 1L year. But at the end of the day, this is the path you chose and if people cannot support the path and the twists, turns and bumps it entails, you probably don't need them in your life. During 1L year, studying will take on a whole new meaning. It is no longer slipping through 10 notecards the night before the test or running through a few old quizzes on Quizlet (somehow that is how I got almost straight As in undergrad... blows my mind now). It has become a semester-long process of reading, lecture, revising, understanding, outlining and memorizing black letter law and then practicing how to apply and write essays and answer multiple choice. You will likely have to attend office hours to have questions answered, you will need to consult supplements... you will make stacks upon stacks of notecards. Outlining will become an everyday reality. You will read until you go cross-eyed, take a break and jump right back in. Study groups may become a tool you utilize despite never studying in a group before in your life. You will have to practice writing essays... something I initially found rather bizarre. Studying will gain a new definition to you by the end of 1L year. Law school does so much more than teaching you UCC 2-207, how to cite from the Bluebook and the elements of adverse possession. It teaches you how to think like a lawyer. You learn to analyze and synthesize what you read. You learn to verbalize what you glean from the reading. You find a way to think on your feet and constantly exercise your brain. You see a situation and think "well there's a tort". The skills you learn and the adjustment in your thinking is what makes you a lawyer, not the law you memorize. Through my internship this summer, I have not relied on my black letter law dictionary in my head or my skill with citations. I have relied on my ability to rationally think, analyze, synthesize and think outside the box. I have been able to think on my feet, answer questions and verbalize my thoughts in front of seasoned attorneys. It is the adjustment in my thinking and analytical skills that I recognize a difference in the most in my everyday life. I approach problems differently. I verbalize better. I ask questions with meaning behind them. I feel as though I left 1L year with a whole new set of thinking skills that will be what carry me through a law career, not my understanding of felony murder. The change in your thinking is all a part of the law school process. 1L year is unlike anything you have ever done before... but you will do it and you will succeed. I hope that these thoughts help you to enter with an open mind and eyes wide open to what the experience may bring. I wish everyone the very best of luck and do not hesitate to contact me with any questions about what else to expect. Hi Brandy - I've enjoyed reading your blog over the past couple of months. I'm starting 1L in less than a month and I'm so excited! I can't wait to get started. Thanks for your insights.